Jacket season is quickly approaching as we enter the month of August. Today we will be looking at a selection of some beautiful jackets for you to wear this Fall and Winter, and have a great time outdoors. 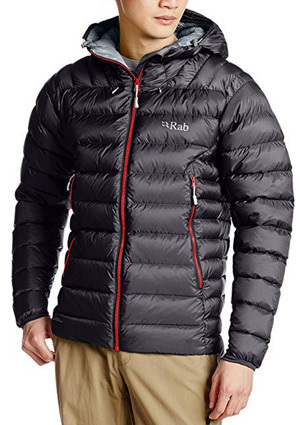 The brand we have chosen today is a newcomer, Rab. This brand was established in 1981 in Sheffield, UK, as a manufacturer of sleeping bags. Later, their product range expanded and their products quickly gained a reputation, making them a favorite among outdoor adventurers, especially climbers. The jackets we have chosen today are a mix of options for men and women, made of the finest materials and great craftsmanship. 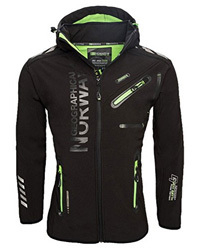 We will start things off with the women’s selection and the first jacket is the Microlight Alpine design. 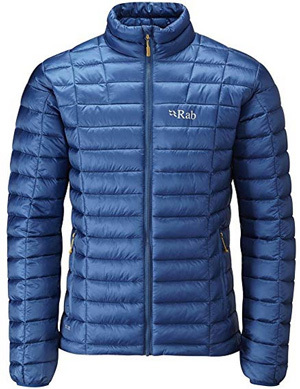 This jacket is made of Pertex Microlight on the outside, with a 100% Nylon ripstop inside. It is a winter design, insulated with 750-fill power European goose down, which is very lightweight and perfect at maintaining warmth. In collaboration with Nikwax, the down has been treated to be hydrophobic, meaning that it won’t lose its insulating ability if water gets through, as it won’t went. 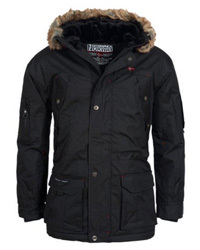 The collar on this jacket is hooded and high, providing protection for the neck and head. To close-off the jacket from the elements, sleeve cuffs are made elastic, also providing a better fit. There are three outer pockets and the main zipper is concealed, with chin guard on the collar to prevent chaffing. There are 15 options to choose from, including: Gargoyle, Steel, Nightshade and Berry. 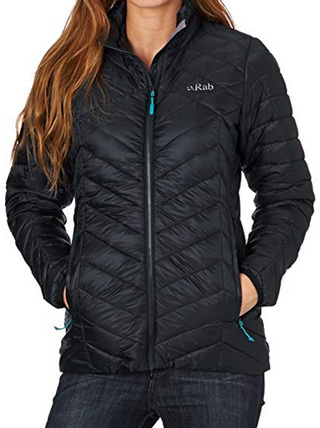 Nebula is an insulated winter jacket, made of Pertex Endurance fabric, and lined with a 100% Nylon lining, which is air-permeable. The insulation is 3M Featherless, which is a synthetic alternative to down, made to closely mimic its performance. The collar is high and there is an attached hood, which is compatible to wear with helmets, too, so that you can ski and snowboard safely. There are two hand warmer pockets on the outside and an internal security pocket. The hem is adjustable with draw cords, while the sleeve cuffs are elasticized for a better fit. This jacket comes in the colors: Beluga, Juniper and Serenity. Altus is a jacket intended for light physical activity, such as walking. This is a highly weather-resistant design, made of Pertex Quantum fabric on the outside and insulated with Cirrus synthetic insulation. 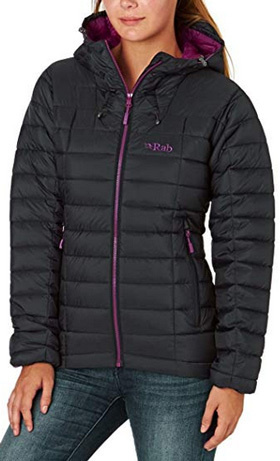 This type of insulation is capable of not only maintaining body warmth, but it also performs well when wet, while being able to quickly dry and return to peak performance. This jacket comes with a medium stand-up collar, which fits snuggly around the neck and prevents rain, snow and cold winds from getting through. There is no hood, which should be kept in mind if you the weather is unstable. The sleeve cuffs are elasticized and there are two hand warmer pockets on both sides of the jacket. It comes with a concealed zipper and in the colors: Ebony tasman, Deep ink, Berry, Juniper and Ebony. We will start the men’s selection with Microlight Alpine, which is made of Pertex on the outside and lined with 100% Nylon on the inside. 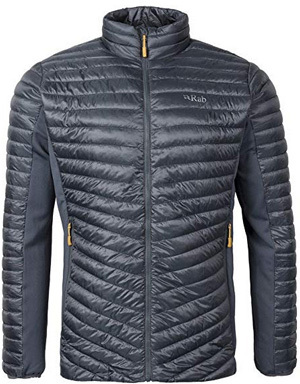 This is a down insulated jacket, which has been treated with PFC-free water-resistant coating by Nikwax, in order to make the down hydrophobic and able to remain dry in the worst conditions. The collar is hooded, which in turn is compatible with helmets and also insulated with down, providing warmth to the head. There are three outer pockets on this jacket, two of which are for keeping the hands warm, placed on the sides, and the third is on the chest. The main zipper is concealed and comes with chin guard, and there are 11 colors available, such as: Steel, Shark, Electric, Beluga, Evergreen and Merlin mimosa. Another men’s version of the previous women’s one, Nebula is made of Pertex Endurance and lined with air-permeable Nylon on the inside. 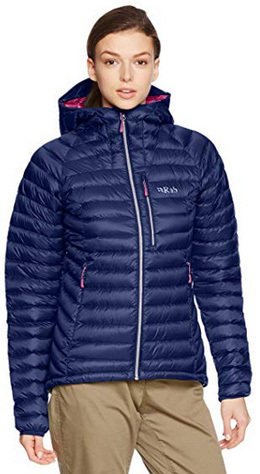 Just like its female counterpart, this jacket, too, is insulated with 3M Featherless synthetic insulation. It comes with a hooded collar and elasticized sleeve cuffs, as well as a concealed main zipper. 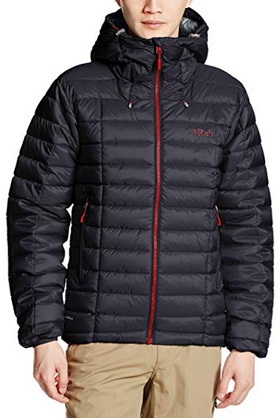 There are two hand warmer pockets on both sides of the jacket and drawstrings on the hood for adjustment. 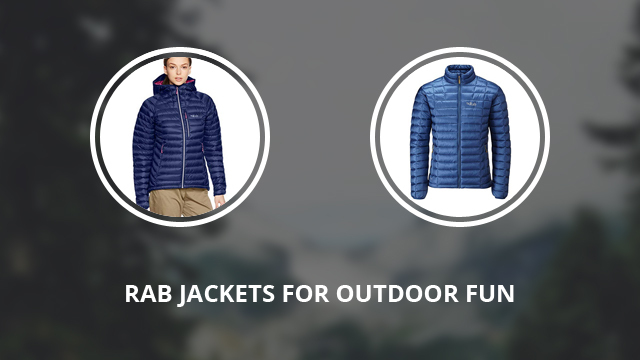 This is a weather-resistant jacket, suitable for low temperatures and comfortable to wear in a variety of outdoor activities. The main color options include: Beluga, Electric and Rococco. Altus is a hoodless jacket, suitable for cold and unstable weather, provided you will take measures to protect the head against snow or rain yourself. The outer fabric is made of Pertex Quantum fabric technology and lined with Cirrus fabric on the inside. The insulation is 3M Featherless synthetic insulation, which is intended to perform like down, without the downside of losing its ability when wet. There are two outer pockets for warming the hands and a security pocket on the inside. The main zipper is uncovered and there is also chin guard on the collar. There are 3 colors to choose from: Ebony, Electric zinc and Ink. Cirrus Flex is also hoodless, with a padded stand-up collar and elasticized sleeve cuffs. 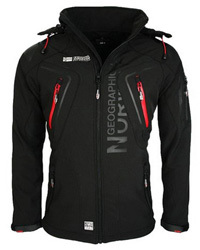 This is a mid-layer jacket, very lightweight and quick drying, suitable for cold and dry weather. 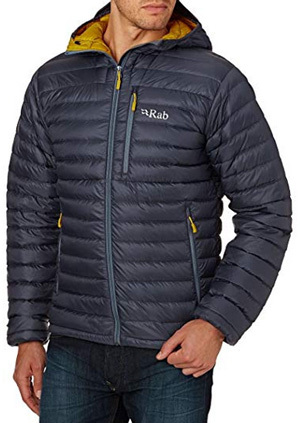 The insulation is 3M Featherless synthetic insulation, with an outer layer made of HyperLite fabric and the inside lined with Thermic stretch fleece, which is very warm and quite breathable. There are two hand warmer pockets on the outside, the left one doubling as a packing pocket, too, due to the integrated pouch inside. You can get this jacket in the color: Ink, Steel and Dark horizon. 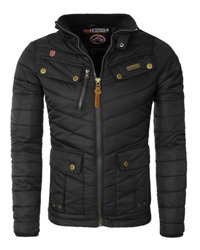 The last jacket is Electron, a design made of Pertex Endurance fabric and lined with 100% Nylon Ripstop. This is a down jacket, insulated with 800 fill power hydrophobic European goose down, which provides excellent insulation and loft. The down is made hydrophobic by the Nikwax PFC-free coating, which prevents the feathers from getting wet and losing their ability to insulate. The high collar is hooded and adjustable. There are two side pockets on the outside and elasticized sleeve cuffs. The jacket packs into a small size, due to the down being capable of compressing considerably, and also due to the reduced bulk because of body mapping, that creates warmth where it’s most necessary. The colors to choose from include: Pluto, Graphene, Ink, Rococco and Graphite.